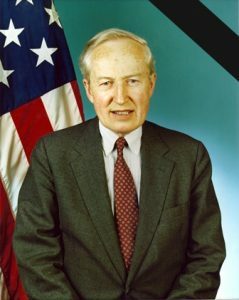 I would like to pay tribute to an honored friend and an American statesman who passed away last month — Donald Kruse. It is difficult to put into words what Don meant to the Holy Land Christian Ecumenical Foundation and, more importantly, to the Christians of the Holy Land. If I am honest, I cannot wrap my mind around the fact that he has gone on to the next world. After many moments of prayer and reflection upon the words of our Lord and Savior, I was graced to understand that Don is not truly gone, for he lives in the good works he accomplished here on Earth. One speech can never do justice to all that he did, all the friendships he formed, and all the lives he left forever changed for the better. But this evening, I hope to pay homage to this gracious man whom I was honored to call a friend. A career diplomat, Kruse served as U.S. Consul in Jerusalem for four years. It was in this service that he became aware of the difficult living conditions of the Palestinian people and the wrongs they endured on a daily basis. Ever a just and prudent man, Don never forgot them. After completing his diplomatic career, Don put his faith into action and took a stand for the Palestinians at a time when no one else would. He shared his knowledge by writing numerous articles about the Arab-Israeli conflict. He served on the board of many charitable organizations, one of which was our own HCEF. To honor his great commitment to the Palestinian Christians we are proud to announce we will be naming a section of the Bethlehem Museum after this great man. Don is the true force behind HCEF. He opened wide the doors of the National Presbyterian Church, giving us a place to gather when this organization was still in swaddling clothes. I can never thank him enough. His experience truly guided us in those first days. And his charisma helped us grow. He was so personable that we have him to thank for our volunteer and support base. Thank you, Sally, for these beautiful words. Although you cannot personally be with us tonight, you and Don are certainly with us in spirit. I am delighted to announce that Don’s family and the National Presbyterian Church have created the Donald Kruse Memorial Fund in his honor to benefit HCEF and Christians of the Holy Land. I like thinking of us sitting together like in days of old, talking, laughing, and reminiscing about all of the good times we had together. And may the justice that Don so fervently believed in come to pass for the Palestinians and all people of the Holy Land. Mr. Kruse is Vice President Emeritus of HCEF. He has a BA from Wheaton College, IL and an MA from the University of Pennsylvania. He entered the Western Foreign Service in 1957. He has been assigned to Toronto, Luxembourg, Paris, Brussels, the Sinai, Naples, London and Jerusalem. He was Western Consul in Jerusalem for four years. He currently serves on the boards of many charitable organizations and leads annual pilgrimages to the Holy Land. He is the author of numerous articles on the Arab-Israeli conflict and on the subject of the Palestinian people.